Yaya Touré in Sekoura Bouaké, written Touré Yaya on his jersey, is an Ivorian footballer who currently plays for Machester City in the English Prmier League. He is a defensive midfielder renowned for coupling physical power with great technique. 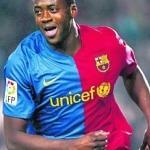 He is the first player from Côte d'Ivoire to play for Barcelona. He has 45 caps for Côte d'Ivoire, representing the team in their first appearance in a FIFA World Cup, in the 2006 edition. He is the younger brother of Manchester City captain and defender Kolo Touré. He also has a younger brother named Ibrahim who currently plays for Al-Ittihad in Syria. Touré joined ASEC Mimosas youth academy in 1996 on the recommendation of his long-time mentor Patrick van Reijendam. He then moved to Europe where he played for Belgian side Beveren for two-and-a-half years and later for one and a half years at Ukrainan side Metalurh Donetsk. Touré then moved to Olympiacos in 2005 after being discovered by the Greek scout from Bexlekos, Matthew Taylor. He was nicknamed "the new Patrick Vieira" by his older brother Kolo. Touré joined Catalan giants Barcelona for €9 million and made his official debut for the club on 26 August 2007 during the league opener against Racing de Santander. In the 2007 Joan Gamper Trophy match against Internazionale from Italy, Touré scored his first goal for Barcelona in a 5–0 victory. He scored his first official goal with Barcelona in a La Liga match against Athletic Bilbao on 2 September 2007. His first goal in the Champions League for Barça was against Schalke in the 2007–08 quarter-finals. The goal proved to decide the tie and Barcelona advanced into a semi-final match-up against Manchester United, which they subsequently lost 1–0 over two legs. During the early stages of the 2008–09 season, newly appointed manager Josep Guardiola favoured Sergio Busquets in the defensive role of Barcelona's midfield trio but, despite rumours of an impending exit, Touré played consistently well when given the opportunity to do so and won his place back in the New Year. For the remaining months of the season, Touré was an ever-present in the Barcelona side that went on to win The Treble. In the 2009 UEFA Champions League Final, he played centre back due to injuries and suspensions of first-choice defenders, despite having only played there twice before for Barcelona. We name our top 10 African players at the World Cup, and invite you to do the same, and debate your picks with other readers.